This Broccoli and Cauliflower Salad is simple to makes and keeps very well for several days in your refrigerator. We love to have this during the warmer summer months and often serve it as the side dish to grilled meats. Break up broccoli and cauliflower into bite size pieces (use florets only). Fry bacon until crisp (drain on paper towel). Dice onion. 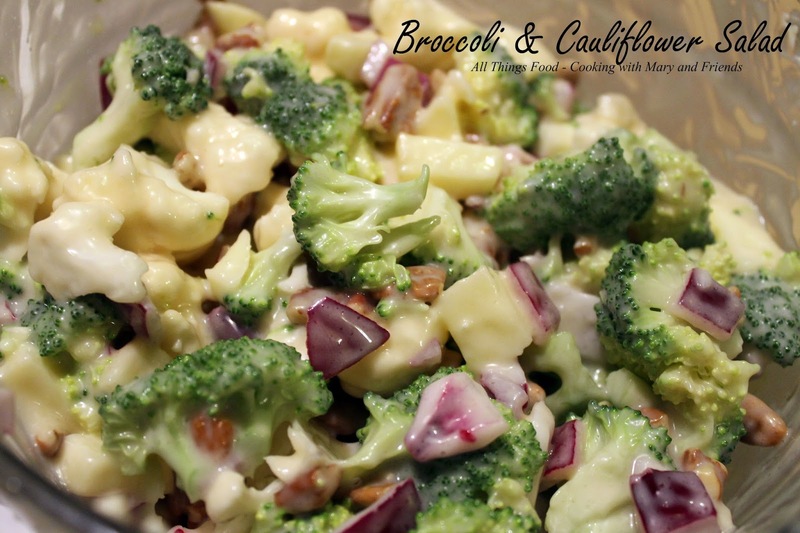 Mix together broccoli, cauliflower, onion, bacon, raisins and pecans. In a separate bowl mix together mayonnaise, vinegar, sugar. Pour over vegetables and mix well. Even better the next day! Stir gently before serving and top with shredded cheddar cheese; serve with slotted spoon. Cook's note - You can also keep the bacon out and add it just before serving. I love broccoli salad!!! Thank you for sharing on Fit and Fabulous Fridays!